Pokhara is a lakeside city at 900 m which in Nepal means the lowlands. Yet the city is at the very foot of the Himalayas. In Pokhara you can combine subtropical climate with snow-capped peaks – added with a green mountain lake. 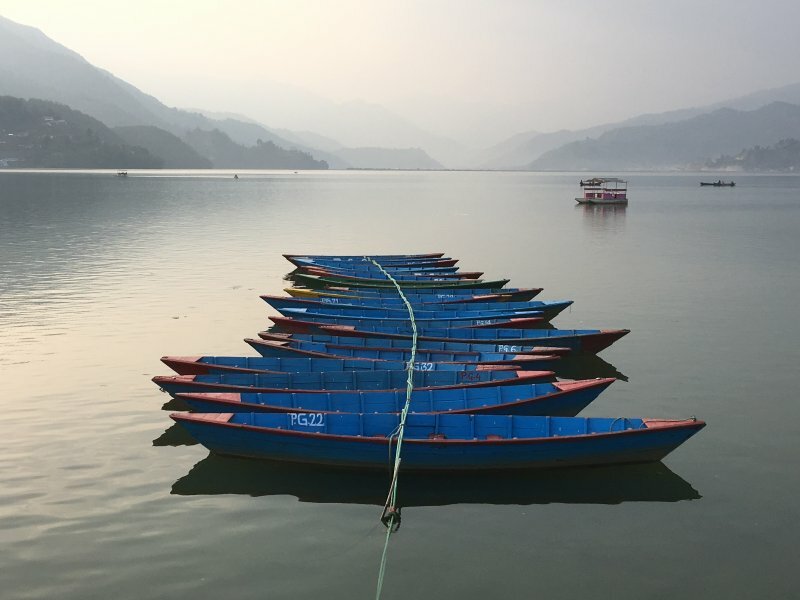 Pokhara, Nepal offers short hikes, a lake and the Annapurnas. The Annapurna Massif is literally behind the corner. The white peaks belong to the world’s highest and rise 7000 m higher than the town. So Pokhara makes perfect trekking headquarters. You can take any number of short hikes on marked trails around the city, or head for week-long treks in the Annapurnas. As a part of a Nepal road trip we spent five days in Pokhara. This post will show you what the lakeside city and its beautiful surroundings can offer. 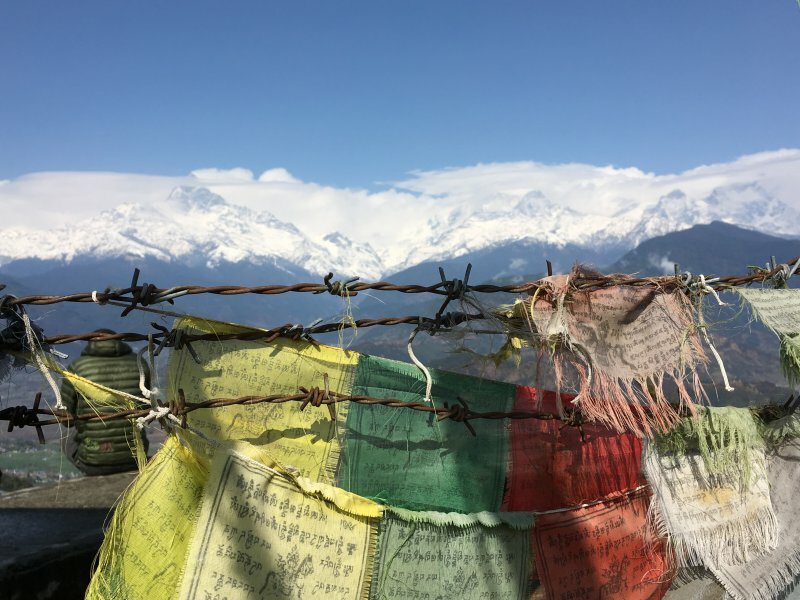 If you want to read about our whole Nepal itinerary you can check out my post Nepal: Nature, Culture and UNESCO Sights. Pokhara is in a valley that has eight lakes in all. You can see the biggest of them, Lake Phewa, on the map. Lake Phewa has wooded hills on all sides except in west where Pokhara city is. Zoom out the map a little bit and you can see how close the Annapurnas are and if you zoom out even more you can see where in Nepal Pokhara is. Pokhara is located 200 km west of Kathmandu which is quite a distance on mountain roads. To get from Kathmandu to Pokhara you can either fly or take the bus. I was explaining how to get to Pokhara in my previous post Nepal: Nature, Culture and UNESCO Sights. The first thing we wanted to do after landing in Pokhara was to see the Himalayas. We had seen them from the plane and wanted to see more, right away. So we took a taxi and asked the driver take us to the highest viewpoint which he did. He took us almost there, as far as he could drive. It was a small village only 200 m from the top and we walked the rest, it was steep stairs. It was a simple village with some shops and restaurants and our driver waited for us while we went up. Below you can see Pokhara lakeside and Lake Phewa. The airport is right behind them, only 6 km from the lakeside. Sarangkot is a 40 min uphill drive from Pokhara lakeside. The road marked in blue is the better one you should take. Below you can see the view tower on the top of Sarangkot, some Sarangkot visitors and nice mountain views from the top. Click on the small photos to open them up in a slideshow. There were no busloads of tourists and no crowds at all, just a few locals, us and the views! But it’s a different thing in the morning. That’s when most people go to Sarangkot, they want to see the sunrise. You will also see the Sarangkot sunrise after a while. So what about the Sarangkot sunrise? Of course we wanted to see that too. To get to Sarangkot in the morning we ordered a taxi the night before. Our driver told that we should leave at 5:30 to be there before the sun rises. This was in February, in other times of the year it will be a different time. It was a pretty long drive, 40 minutes and it was still dark, just like in the middle of the night. The only thing I could see on the way up was the driver’s Buddha amulet hanging against the windscreen. But it was a nice Buddha. We didn’t get a normal hotel breakfast that morning but our hotel gave us a picnic box which we took to Sarangkot. The driver left us where long stone stairs to the top began. It was a different place than last time and closer to Pokhara since there was a lot of traffic. He told us to walk the rest. So we kept walking and used our phones to see something. And we walked up the stairs following the crowds – until someone invited us to their terrace and gave us chairs and warm blankets. It was dark and cold. But the sunrise was already there! The sun changes the mountains from purple and pink to gold. It’s a fantastic sight but it all went quite fast. We saw the sun come up and minutes after that came the clouds. Today was going to be a cloudy day so this is what we saw about the Himalayas today. But we knew there would be clouds. We were using many different weather apps and they were right. So our plan was to hike after the sunrise. The crowds left and soon it was just us in Sarangkot. What a happening it was! Every house owner takes sunrise tourists on their terraces up on the hill. And they will repeat it every single morning. The terraces are very well located and I don’t know if the official viewpoint at 1592 m offers any better views. The sun rises from east so you need a view in that direction. It was still early morning and there was nothing more to see in Sarangkot village so we started looking for the way down. We had a whole day in front of us and no taxi driver waiting. What would be a better idea than hiking back to the lakeside? The Sarangkot view tower is connected to Pokhara Lakeside by a simple stone path. The path goes straight down and is mostly stairs. It’s the path the locals use to get to their hillside homes, to get to school, bus stop and to bring home some drinking water from water pipes. It was hard to find the place where the trail starts. It turned out that the sign was only visible from one side and we first missed it. We almost walked to the next village Kaski searching for the trail head. First coming back the same route we finally found the place. It says it’s an hour’s walk down but I would rather say it takes 2 to 4 hours – at least if you are climbing uphill beginning from the lakeside. I didn’t get the hike on a Google map but the Google satellite view clearly shows the trail. You can see it go straight down from Sarangkot. We had a nice walk down through people’s backyards and local villages and we also had our breakfast sitting on the stone hedge. Though that was not a good idea, from that on we had a dirty small dog following our every step. The dog came almost all the way down – until we met some paragliders on their way up the stairs. They were so nice and took the dog back to Sarangkot. Down on the lakeside it’s equally difficult to find where the trail begins. But if you look for the place where they are building a cable car line it will be close to that. Just ask since there are no signs. At least not in English. Pokhara is divided in a lakeside tourist area and an old city where the locals live. The city is surprisingly big and covers most of the valley. 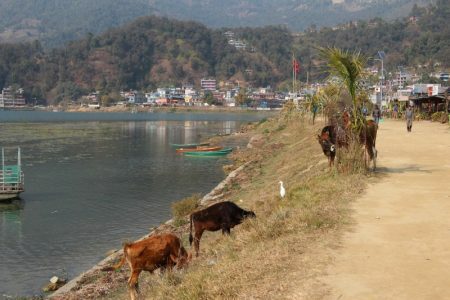 The old part of Pokhara is interesting to see but most tourists prefer to stay by the lake which we also did. Sometimes it’s just nice just to be a tourist. And as we all know tourists often find the best places to visit. Tourism to Pokhara began with the hippies. The hippies were looking for new, fresh places beyond Kathmandu. That was in the 1970s, by the time when the first road to Pokhara was opened. So the hippies found Pokhara and simple lodges and bamboo cafes were opened for them on the lakeside. A Modern Tourist City Or Not? The hippies’ homes still stand there but otherwise the lakeside of Pokhara is more like a modern tourist area anywhere else in the world. Almost. The word modern has a different meaning in Nepal. Or what do you say about all those cables hanging everywhere in the air? This is Nepal. So those cables were all over but we didn’t let that disturb our Nepalese dinners. The only thing we had to worry about when dining were the rupees that had so many zeros. That needs some counting. I made a small photo gallery on Pokhara’s tourist area. Click on the small photos to open them up in a slideshow. 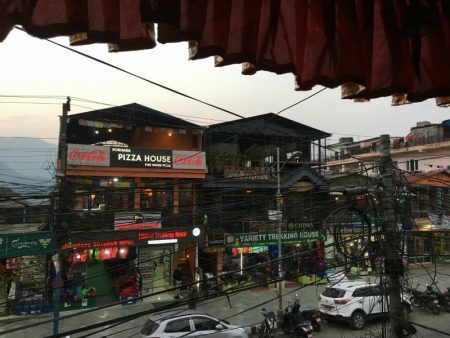 An essential part of Pokhara’s tourist area are the hotels, shops and restaurants – and the lake and the lakeside promenade that you can walk along. Or even better, you can rent a boat and row on the lake. On calm days Lake Phewa is like from a postcard. When we were rowing the water was green. It was reflecting the green jungles around the lake. And in the opposite direction again the blue sky and white peaks were hiding in the water. The jungle hills grow many exotic plants that don’t exist in Kathmandu Valley. Kathmandu is located hundreds of meters higher up than Pokhara and the climate is colder. We rented one of those painted wooden boats that exist everywhere along the shoreline and rowed to the opposite side of the lake. From there you can see the Annapurna mountains. Yet it was not the perfect weather for mountain viewing. It was a bit misty but we enjoyed our rowing trip in any case. It was quiet and there was just the birdsong. The lush Pokhara Valley has hundreds of different birds, both exotic and more familiar. You can rent a boat for an hour or a day and with a driver or without. And if you are traveling with a group you can choose a bigger boat that has a roof. You also have to rent a life jacket. What is good there are many different sizes including the XL size for us big Europeans. This was Pokhara lakeside. And now some words about the rest of the city, the Old Pokhara that fills the valley. We went a couple of times to the old part of Pokhara but it didn’t really offer us anything. 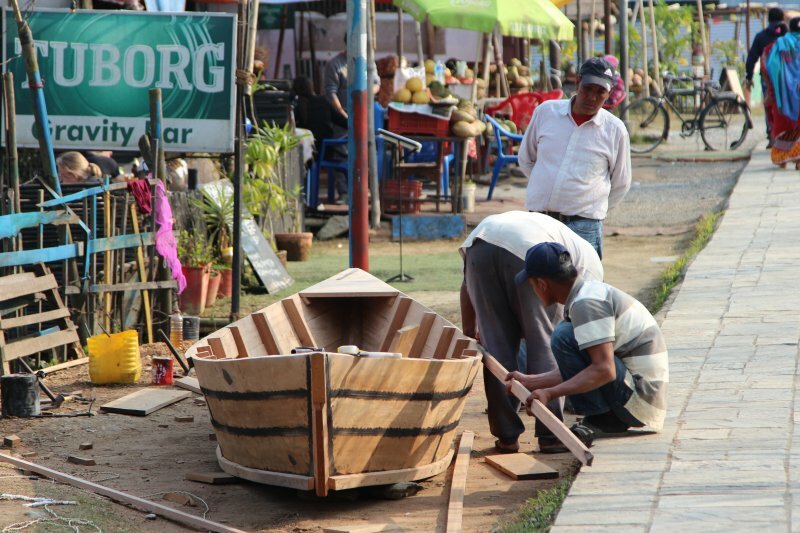 You can see local life as it is, cows on the road, shops selling household items – and there’s a lot of roadwork and building going on in all places. Pokhara is growing. There’s a market place but as we normally don’t have any shopping needs on our trips we were not really interested in the old bazaar either. We also preferred having our coffees and meals in the tourist area. So on this trip we behaved like real tourists. Now we know what Pokhara is like and we could hike a little bit again. We will walk up the green hills and to World Peace Pagoda. The hike to World Peace Pagoda must be the most popular Pokhara hike. It’s a short and easy walk provided you return the same way down to the lake which we didn’t. We took a longer way back round the hill and I marked our route on the map. To begin with you will have to take a boat across the lake. Ask the boatman take you where the trail begins. It’s a nice quiet bay with a small sandy cove. There’s a blue Hindu statue right on the water and an equally blue restaurant behind it. Not much else to see but there is no road to this place either. You have to arrive by boat. But the path is waiting. You will have to walk straight uphill. It’s a steep climb in a thick forest but the path is good and partly stairs. The World Peace Pagoda trail is easy to follow and there are good signs. What is the World Peace Pagoda for? It’s a white Buddhist stupa built by Japanese monks, for the world peace. The stupa itself is quite small compared to others we have seen on our trips but this one is equally pretty. Like are the views across the lake to Pokhara and the Annapurnas beyond it, provided there are no clouds. You can use the same stairs down and take a boat which is the shortest alternative. Or you can walk back to Pokhara along the other side of the hill, there are some alternative routes. We took the stairs down on the other side of the hill. There was a small village and a car park. From the car park we took the Pokhara road which was very good to walk but not really a road for cars. At least I would never take this road with my car. We only saw motor bikes on the road and even they had to stop all the time. 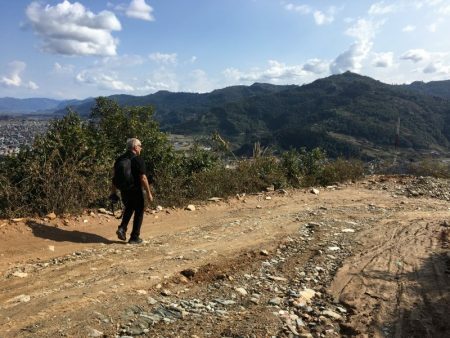 We walked through terraced slopes and old villages. It was a great day out in the sun and we walked quite a bit. This was a lovely walk and a bit longer than we thought. We maybe got lost, or maybe not. Since there were no signs that would show the way back. So we just took the first road that probably not was the shortest one. But the scenery along the road was fantastic and that made me so happy. And my good hiking shoes made me happy too. That was the World Peace Pagoda hike. There’s one more place I want to show you in Pokhara. It’s a Tibetan village. 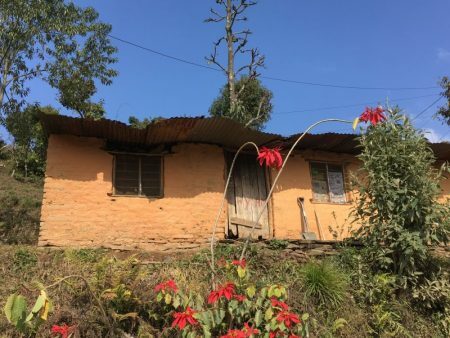 Did you know Pokhara hasTibetan villages next to the city? One of them, Tashi Palkhel, also has a Tibetan monastery so took a taxi again and went to see the place. As Nepal has Tibet as a neighbor Tibetan culture can be found in many parts of the country. Tibetans living in Nepal have a refugee background. 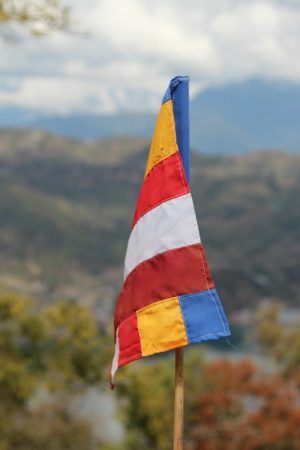 Over 20 000 Tibetans have migrated to Nepal, most of them in the 1960s after the 1959 Tibetan uprising. 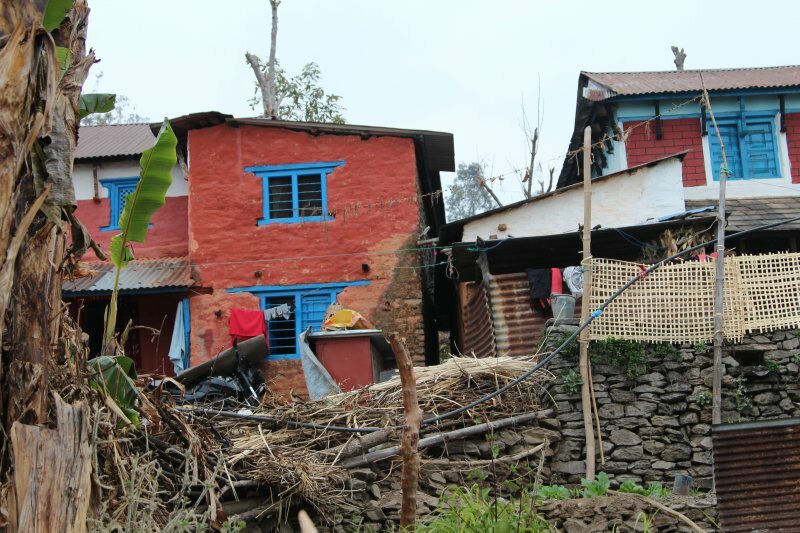 Many Tibetans still live in refugee camps around the country three of which exist in Pokhara. One of the Pokhara camps is Tashil Palkhel Tibetan village 4 km north of the old city, 9 km from the lakeside. You can see the location the Tibetan village with a monastery on the map. The Tibetan monastery has as many as 180 monks. If you only can try to go to the monastery in the late afternoon. In afternoon you can see the monks’ meditation moment with typical religious music and chants. The Tibetan style differs a lot from the Nepalese. Jangchub Choeling Monastery has one big and a thousand small Buddha statues and all kind of Tibetan decoration in strong colors. And of course the Dalai Lama photo has a central place in the monastery. This is a massive prayer stone outside. People touch its letters when they pray. The monastery is so close to the Himalayas and Tibet that you can almost believe you have come behind the mountains. This was a little journey to something new we were not familiar with. If you want to learn more about the monastery there’s information about it on this website. So this was Pokhara with its lakeland and mountains. We liked the place and I hope my post helped you think about if this could be a place for you or not. Maybe you are planning a trip to Pokhara, Nepal, this year or next year, or maybe some day in the future? In that case, hope to see you in Nepal and Pokhara!